The year has come to an end and we can finally put our feet up and relax as all Cooper Dust Series events for 2018 have been completed. This year the competition was run over 7 regions with three events in each region with nearly 300 participants taking part in the various regions. 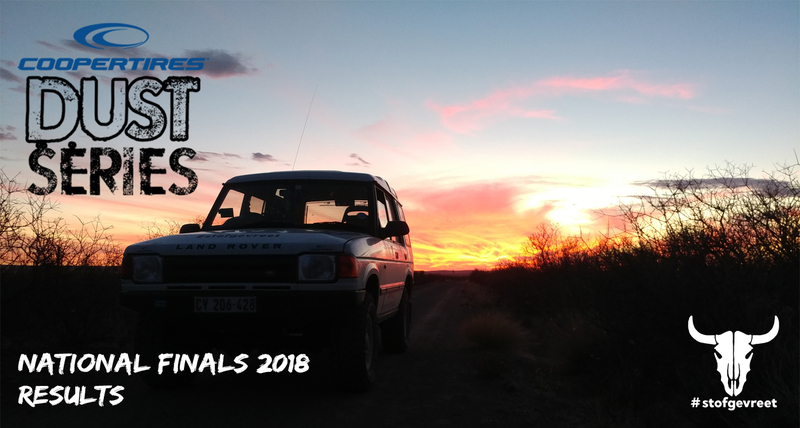 Out of all these participants, there were 70 qualifiers for the final, and eventually, 23 brave competitors lined up for two days of off-road driving and navigation whilst having their skills tested in various aspects of these disciplines in the picturesque Van Wyksvlei in the Northern Cape. This little town plays host to the annual Weg Ry & Sleep Bull Run, and due to its central location, with all teams being far from home during the final, paired with the neutrality of the venue, it is the perfect location to host this event. Not only is the terrain and region perfect, the spitbraai at the prize giving has been described as making all the dust and wind that was endured worth it. The locals really pushed out the boat on this one and we can only commend them and thank them for allowing us to come and mess up the town’s hair for a weekend. To not put too fine a point on it – the Cooper Dust Series is not your normal 4×4 competition where you point your vehicle, close your eyes and shoot. Using your brain, knowing your vehicle and being able to adjust to your circumstances was the ultimate question that was asked of competitors. Some answered with aplomb, but others were a bit more pushed to deliver the right answers to the questions asked. In the end, it was the brothers from Trawal in the Western Cape, Johan and Herman van Zyl in a Toyota Hilux 4.0 V6, which walked away the winners. They bagged a Cooper Tyres voucher to the value of R16 000, the trophy and bragging rights for the next year at least. But it was not all a walk in the park for them. All teams that took part in the final were in with a good chance of walking away with the laurels. The scores were of an outstanding nature and all teams can feel extremely proud with how they ranked. What’s more, the podium finishers were all three from different regions, and all three were first time competitors in the final. The highest place repeat competitors were the legendary Nissan Navara V6 with Hannie van Rooyen (drie-ses-vier) and Rustie du Preez, and the not so standard, standard Toyota Fortuner of AJ Joubert and Stephan Coetzer. This year also saw the first female drivers taking part in the final with Jessice Combrink and Joelene van der Walt representing Mpumalanga. Joelene also walked away as the regional champion for Mpumalanga. Kobus and Jacques Breed of Gauteng, and Kurt Cronjé and George Marais from Limpopo were the sole competitors from their regions, and they both made some new friends, showed they are ready to compete and will go back home and tell all their friends how they missed out on an awesome weekend. The podium was shared by the father and son team of Piet and Coenraad Kotze from the Free State with his Volkswagen Amarok 2.0 TDI in second place and Steven de Beer and Ross Curry from the Eastern Cape with their Ford Ranger. The scores were quite close, apart from the Van Zyl brothers who were clear winners, the rest of the top 10 were separated by less than 65 points. One or two small adjustments and getting things right could have changed the scores and placing for some teams dramatically. The difference was that slim. Special mention must however be made of Charles ‘Hin hin’ Muller and Reinard Visser in the blue Toyota Hilux with the Lexus engine. After being out for the count on day 1 after a mechanical issue, their mechanic drove up to Van Wyksvlei, worked into the late hours of the night to fix the vehicle and they were part of the competition again on day 2. This shows how much it means to someone who took part in his third final to at least take part again. They were also not alone in this with Cornel Möller and Ronja Thirion taking part from the start on day 1 with a Jeep Cherokee XJ without a front differential, and only in two wheel drive. And even they still placed respectably on the leader board. Alles van die finale rondte by Van Wyksvlei was aangenaam, die ondervinding, wind, stof, mense, alles was lekker. Baie dankie aan die organiseerders, marshalls, almal wat deelgeneem het, die mense wat vir ons die spitbraai en ander kosse voorberei en gemaak het, (die pampoenkoekies is soos poeding vir my) die plaasboere dat ons op hulle plase kon ry en die Karoo natuur geniet, (die mooi en groot aantal kokerbome sal ek nog vir jare onthou) die vars lug inasem.